It so easy for me to worry about the future, wondering if I’ll have the spiritual, emotional, or material resources I might need. It is then Jesus’ prayer becomes so instructive. 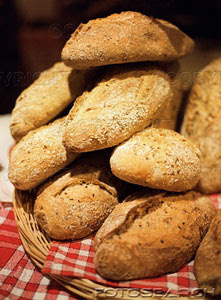 “Give us today our daily bread,” Matt 6.11. But how come this bread delivery apparently never lasts more than a day? I believe it is because God only promises to provide for the next step in our journey. He never promises bread for next week, or next month. Only for the next step. God doesn’t want us to store up a warehouse full of blessings and then not have to turn to Him for another couple years. Instead He wants us to trust him for new reserves every day. · In the Old Testament wilderness, God provided Manna for His people – but only one day at a time. They woke every morning dependent. · In Matthew 10, Jesus comforted His disciples saying if they were persecuted, in that very moment, God would give them the words to say. No words ahead of time, so don’t rehearse them. · In Philippians, as Paul faced an uncertain future, he was confident that whatever he faced, God would give him sufficient courage at that time. Courage is only earmarked for the time it is needed. In other words, when you get there, so will the resources. That’s why it’s daily bread.